Follow the steps below to complete your transfer to UW Oshkosh. If you have questions as you complete the transfer process, please feel free to email or call us at (920) 424-3164. We look forward to meeting you when you arrive on campus. NOTE: Our transfer process is Web supported. You will receive an email with these steps. In order to continue with the post-admission steps, you will need to submit a $100 tuition deposit or request a deferral. Once the deposit is received and processed, you will be eligible to schedule an academic advising appointment, access your University email account and register for classes. Within three days of your admission being processed, you will receive an email with a link to submit your tuition deposit. If you do not receive this email, or if the deposit is a hardship at this time, please contact one of our transfer counselors at transfer@uwosh.edu or call (920) 424-3164. As a student, you will have three different accounts that have different login requirements. Titan Web is your student account from which you can find your enrollment date, enroll in classes, pay your tuition, manage your financial aid and generate reports. You also can access Titan Web by going to www.uwosh.edu/tw. Your User ID is a: Capital “W” followed by your 7-digit student ID number. Your default password is the: First two (2) letters of your first name, first two (2) letters of your last name and the last four (4) digits of your student ID number. All letters should be capitalized. Passwords are case sensitive. It is highly recommended that you change your password immediately after your initial login. Your new password must contain six (6) or more characters and at least one (1) digit. After you have finished changing your password, logout and log in again with your new password. Forget Your Password or Having Trouble Logging In? Contact UW Oshkosh’s academic computing help desk at (920) 424-3020. They will be able to assist you. Please make sure to have your student ID number available before calling. If you would like more information on using the various features of your Titan Web account, tutorials are available on the Registrar’s website. You’ve already logged in to TitanWeb via step 2. This step will get you set up with your UWO email, which is operated through Google. Most immediately, you will use your UWO email account to access the Transfer Advising Appointment Request Form in Step 5. Your UW Oshkosh email account is extremely important, as it is considered the official method for communication at the University. The University expects that email communications will be received and read by students in a timely fashion and recommends checking this account at least twice per week. Approximately two days after we receive your tuition deposit, your UW Oshkosh email account will be active and ready for use. You can verify that your account has been created by searching for your name in the online directory: www.uwosh.edu/directory. If you can find your name, you should have a functional UWO email, ready for use. Click on the Login to TitanApps link on the right side of the page. Enter your password. Your initial password is your seven-digit student ID number. Note: If you already have a gmail account, you will need to sign out of that account before you can activate your UWO email account. When logging into Titan Apps, make sure to include your full email address when logging in. (ex. smithj00@uwosh.edu). You can also visit the academic computing website for additional information on how to log in. This is the last account you must activate as a new student. Your NetID is used as a login for computer labs on campus, to access the D2L system, to sign up for housing, to access the WiFi, to utilize your My UWO Portal and as a login for various websites. Your username is the first part of your email address. Do not type “@uwosh.edu” after your username. Your current password is set to your 7-digit campus student ID number. You must type in a new password and make sure it meets the criteria set on the right side of the page. Type new password again to confirm that it matches. We strongly suggest you request an academic advising appointment as soon as possible. You must have your UWO email open to access the advising request form. Please complete the following electronic form to request an advising appointment: http://goo.gl/forms/idTkjJKJrQ. If the major listed on your application is no longer accurate, select the correct Intended Major as part of the Transfer Advising Appointment Request Form. You are only able to request an appointment using this online form. At this time, you do not have an assigned advisor. An advisor will be assigned after you have completed your advising appointment. Advisors can explain college/degree/major requirements, help you interpret your transfer credit evaluation, and assist with coursework selection for your first semester at UWO. An advising appointment is required for all transfer students. All transfer credits will be reviewed and posted to the student’s record prior to their appointment. We prefer students come to campus to meet with an advisor, however, we recognize traveling to campus is not always an option. Phone appointments or Google video chat appointments are available upon request. File the Free Application for Federal Student Aid (FAFSA) at https://fafsa.ed.gov/ as soon as possible after October 1 to be considered for financial aid. The UWO school code is 003920. The priority filing date at UWO is December 15 for the following academic year. UWO students receive an enrollment date for each term. Students are not able to enroll for a given semester until their enrollment date. Students are assigned an enrollment date based on the number of earned transferable credits. Students can find their enrollment appointment listed in their TitanWeb account under Enrollment Dates on the right hand side. If you are able to register for your courses prior to your scheduled advising appointment, we recommend that you sign up for courses and then finalize your course selections with your advisor during your appointment. If you do register without meeting with an advisor, it is still in your best interest to follow up with an advisor to confirm that your selected courses are going to help you achieve your desired educational path. For further instruction on how to register for your courses, please refer to the Student Help Web page created by the Registrar’s Office. If you are unable to find the help you need on this website, please call the Registrar’s Office at (920) 424-3454. Earned at least 48 credits by the first day of classes. Lived on campus for four semesters (includes previous schools). Will be 21 years old by the first day of class. 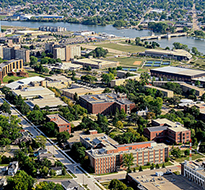 Commuting from a parent or legal guardian’s permanent home located within 45 miles of UW Oshkosh. Married, veteran or single parent. If you will be living on campus, you can apply for housing online. Please be aware that you must have already submitted your $100 tuition deposit (step one) in order to begin your housing process. Visit the Residence Life website for more information. If you have completed a transferable college level math and English composition course, you do not need to take a placement test. Step 10 will explain how to review your Transfer Credit Evaluation, which tells you if you have a transferable math and English course. However, if you have not completed a transferable college level course in each subject, you must take a placement test. The majority of transfer students do not need a placement test, but if you are unsure, please contact the Office of Admissions at transfer@uwosh.edu or (920) 424-3164. For placement test dates and availability, please see http://www.uwosh.edu/testing/test-information/uw-system-placement-test. Approximately two weeks after admission to UW Oshkosh, your transfer credits will have been reviewed and posted. You can see how your credits transferred by generating a Transfer Credit Report. 1. Access your Transfer Credit Report. 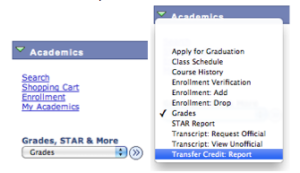 Once you are logged in to TitanWeb, click on the drop-down menu under “Grades, STAR & More“. Select “Transfer Credit: Report” and click the double-arrow button next to menu. Click on the “Self Service” link in the menu on the left side of the page. Click on the “View Transfer Credit Report” link that appears in the menu. STAR is your degree progress report, which lists course requirements for the specific degree, major and minor (if applicable) you have declared. This report indicates which requirements you have already completed, including your transfer courses, as well as the requirements you have yet to fulfill. Your degree audit is called STAR 2.0 and can be viewed through your TitanWeb account. To view your STAR report, please follow the instructions here: https://www.uwosh.edu/registrar/star-help/student-faqs. We recommend students review their STAR report, if possible, before meeting with an academic advisor. Your academic advisor will explain how to interpret your degree audit during your first appointment (see step 4). What Does My STAR Reflect? Your STAR is personalized to you and is updated continuously to reflect courses you have completed, UW Oshkosh coursework you have in progress as well as any changes made to your record. Courses in progress at another college or university and CLEP or AP scores do not appear on your STAR report until official transcripts or score reports have been processed. Use your STAR along with the degree planning guides available on the Undergraduate Advising Resource Center (UARC) website to track your academic progress. NOTE: Your STAR will not be accessible until we have received and processed your tuition deposit. Visit Titan Central, located on the first floor of Reeve Union. Bring with you a valid form of ID, such as a driver’s license or passport, as well as your student ID number. There is a $20 fee for your TitanCard, which can be paid that day or billed to your student account. Students often pick up their TitanCard on the day of their advising appointment or during Transfer Orientation. If you haven’t already completed a formal tour of campus, we highly recommend you take one! The Admissions Office offers a variety of tour options. Sign up for a tour here. Purchase a commuter parking permit here. Commuter student parking is guaranteed. If you’re living in the residence halls, you will be sent a parking permit application from the Parking Services Office prior to the start of the semester. Students living on campus are not guaranteed a parking permit. Most transfer students are enrolled in coursework at the time of admission and are admitted on a conditional basis. Send a final transcript to the Admissions Office once all final grades and degrees are posted. Many colleges and universities do not post degrees until a month or two after the end of the semester, so please ensure your expected degree is posted before sending your final transcript. Students will not be permitted to enroll for future semesters if a final transcript is not received. If you took any AP or IB tests during high school, or received military credit, you may be eligible for college credit. Click here to view the AP and IB Credit Charts. Students should have all official score reports and military transcripts sent to the Admissions Office. AP Scores can be requested at https://www.collegeboard.org/. UWO’s institution code is 1916. An email will be sent to the account listed on your application, as well as your UWO email account, inviting you to Transfer Titan Takeff, our orientation program for new transfer students. This email is typically sent in December for new Spring students and in April or May for new Summer & Fall students. Register as soon as possible to select a date that works with your schedule. We strongly encourage you to attend orientation to meet other new transfer students, connect with student resources, and ensure you are prepared for the first day of classes. Advising and registration will not be included in this day, see Step 5.